First we nuked their islands and then we took control of the whole region. 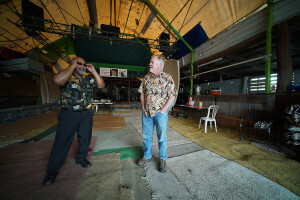 In exchange, Micronesians can move to the U.S. without restriction. And they are coming — by the tens of thousands — for health care, education and jobs. 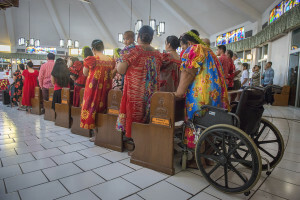 Most Americans have never even heard of the Compact of Free Association, but that may change as federal aid runs out, raising urgent questions about our moral, financial and legal responsibility to Micronesians. This “nuclear nomad” just wants to go home. Except home is a contaminated atoll 2,000 miles away. Diabetes and cancer are rampant throughout Micronesia, largely thanks to the legacy of nuclear tests and Western culture. But most islands lack adequate medical facilities, making migration a necessity. 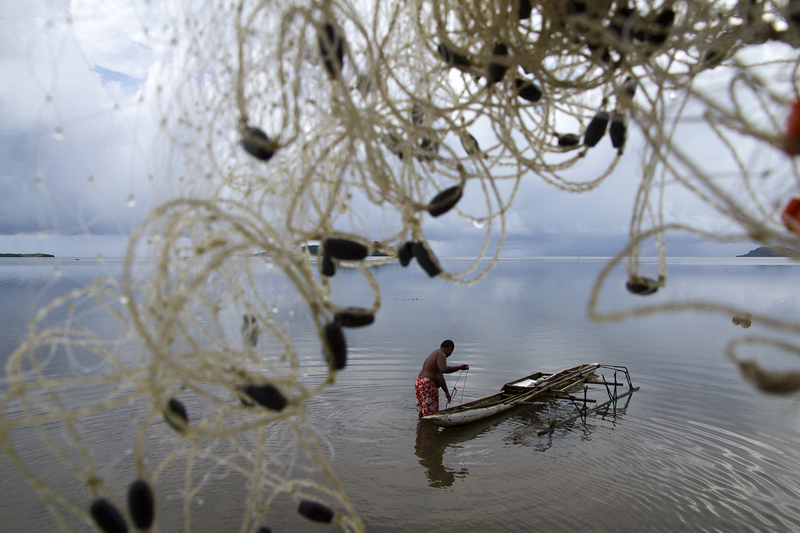 Rising tides and changing ecosystems are destroying the subsistence lifestyle on many islands in Micronesia. If disease and a sinking economy don’t drive residents away, global warming just might. 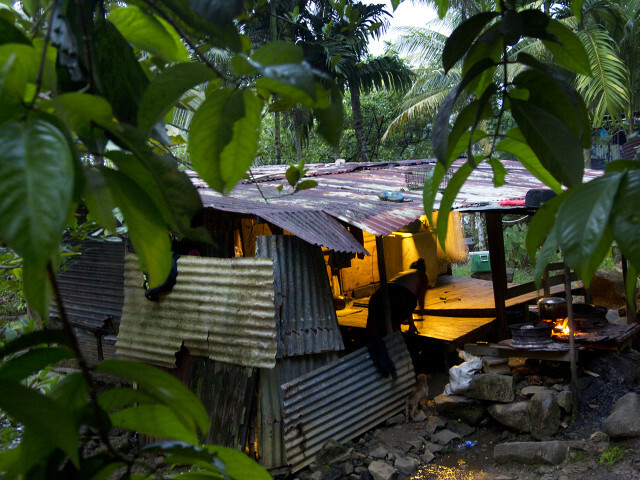 The U.S. has been funneling billions of dollars to Micronesian nations since 1986. That money is very likely going to dry up in just eight years. Then what? The Micronesian diaspora has spread out across the country, but many Americans still don’t realize who their new neighbors are. Civil Beat is an independent news organization. 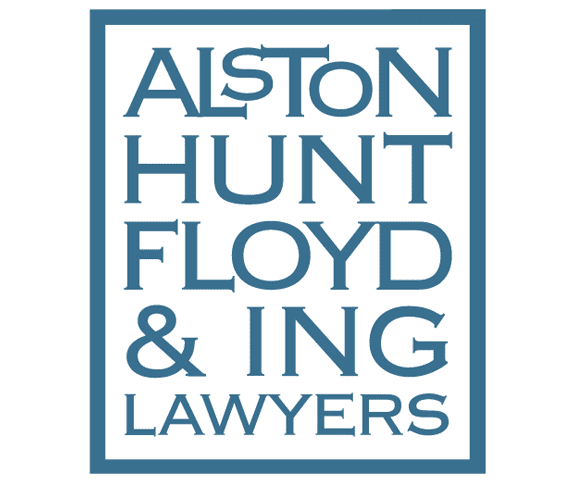 While we do accept underwriting to help us produce content for the site, our sponsors may not and do not influence our coverage or the substance of our articles. On Majuro in the Marshall Islands, the dead are so close to the living that Marshallese children play on concrete burial sites marked by white plinths and headstones. 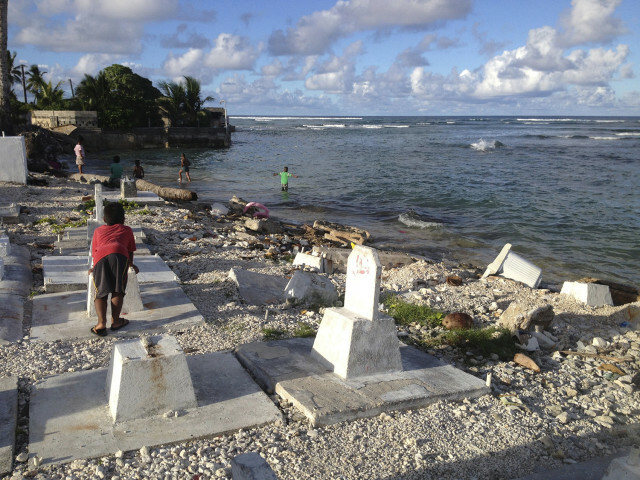 Land is so scarce on parts of this small island that this particular cemetery is squeezed between homes, some abandoned, each hugging a narrow, rocky coastline on the ocean side of the atoll. Giant tides exacerbate eroding soil and nearly a dozen graves have fallen into the sea and washed away. Several others appear poised to follow out on the reef. Their strip of sand and rock is only a few feet wide, a shoreline littered with coconut husks, fallen palm trunks, rubble and plastic debris. Tombstones and markers are slipping into the sea as the ocean reclaims the land. 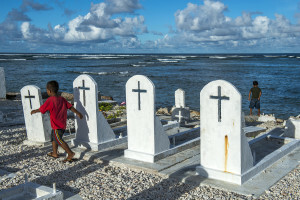 The cemetery, located near Rita on the west end of Majuro, has been eroding for a decade or more, islanders say, something they attribute in part to global warming. The ocean inundations are larger and occurring with greater frequency. In Laura, on the east side of the atoll, one cemetery is reported to be already underwater. 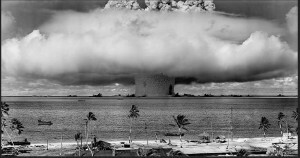 Nuclear tests nearly 70 years ago first forced the relocation of Bikinians to Kili, Majuro and other islands. Contamination is still so prevalent that any return to their home islands is still likely decades off, but now another threat is eating away at the islands of Micronesia. 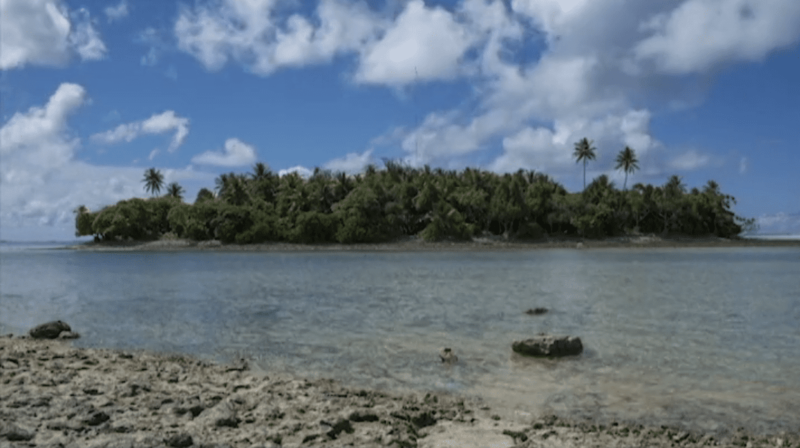 Global warming may force the inhabitants of these far-flung Pacific atolls to move once again as the very land they live on gives way to rising tides, groundwater contamination and the loss of local fisheries. “We want to relocate to the U.S.,” Bikini Mayor Nishma Jamore told U.S. Assistant Secretary of the Interior Esther Kiaaina in March when she visited the region. 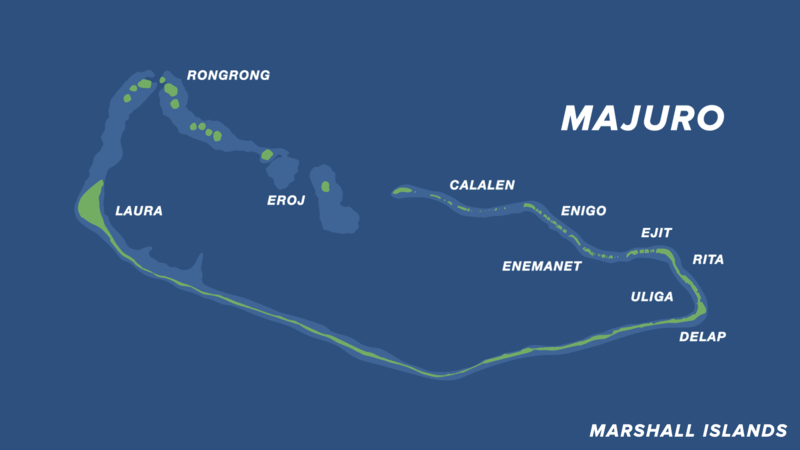 View Larger MapLongtime residents of Majuro, a narrow, low-lying coral atoll, say storms and flooding have grown in intensity. Flooding on Kili — another island that has become home to Bikinians — was so bad in March that two feet of salt water damaged homes and food crops, he said. On Majuro, the runway at the international airport, which is situated on land so narrow that both the ocean and lagoon are in view, looks like a river after heavy rains. Global warming is bringing warmer temperatures, rising sea levels, more volatile storms, record droughts and torrential floods to the islands of Micronesia. And its evidence is everywhere. Deonaire Keju, the vice principal of Ebeye’s elementary school in the Marshalls, says the island’s beaches have changed significantly since he was a child. He points to photos he took of Eneboj Island, just north of a reef and channel that separates it from the U.S. Army’s Ronald Reagan Ballistic Missile Defense Test Site on the island of Kwajalein. The photos show palm trees with their roots exposed and fallen trunks lying on narrow strips of sand that separate island foliage from the reef. 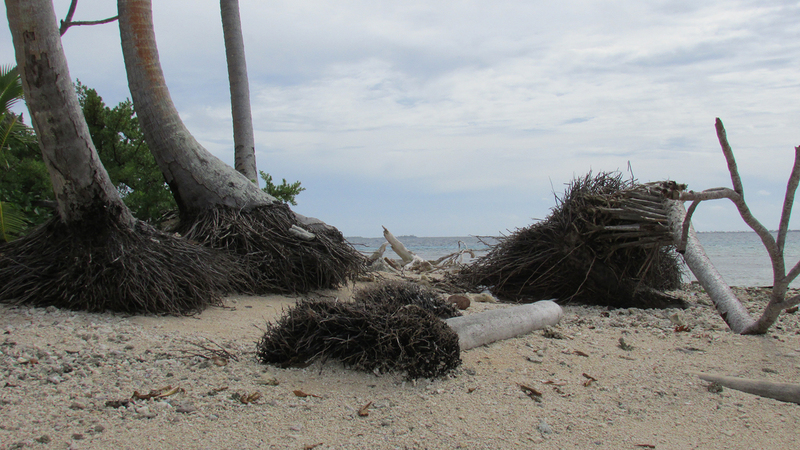 Eneboj island on Kwajalein Atoll, where rising sea levels are claiming beaches and toppling palm trees. Altered coastlines aren’t the only examples of global warming’s impact. Coral bleaching, caused by warmer sea temperatures, is depleting marine life. “When I was a kid,” says Wilfred Robert, the chief of staff to the governor of Chuuk, “I would go spearfishing at high tide, and I would catch fish this big,” indicating the length from his elbow to his hand. Today, he says, the catch is more likely to be only the size of his hand. Micronesian leaders are worried, and they watch their citizens fleeing in ever greater numbers to the U.S. and Guam where, as part of the treaty called the Compact of Free Association, they are allowed to move without restriction. "I think when you just label people because of a few bad apples, and say that everyone is here just trying to work the system ... a lot of times it’s trying to survive." 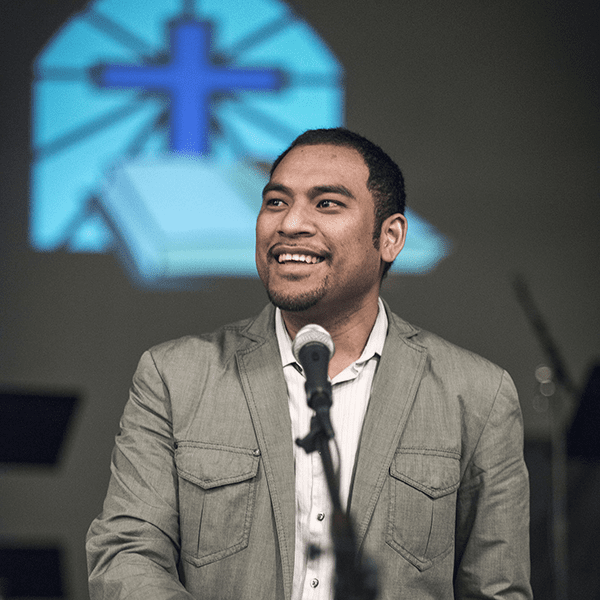 Joe Enlet, a Chuukese pastor in Vancouver, Washington, is an advocate for fellow Micronesians. That out-migration is expected to increase in coming years, not only as climate change takes its toll on the islands but because U.S. assistance is expected to dry up, and with it the money that is helping build roads, bridges and other infrastructure aimed helping keep the rising tides at bay. And unlike low-elevation communities on the mainland, there are few options for Micronesians should their island homes become uninhabitable. 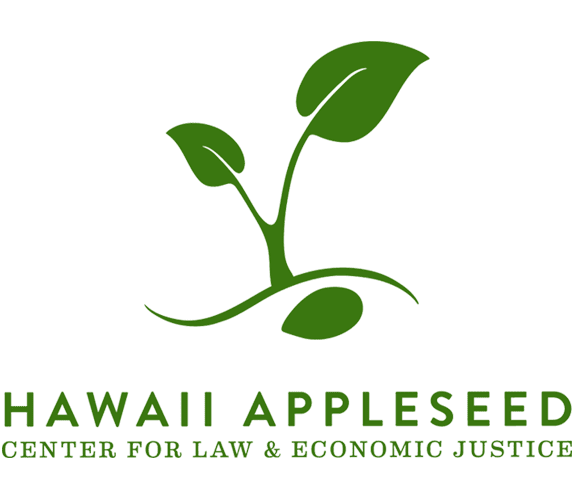 “Who do you become when your heritage, your traditional ties to your homeland and cultural practices, are swallowed by the sea?” University of Hawaii law school student Ana Cornwell wrote in a study of the issue. 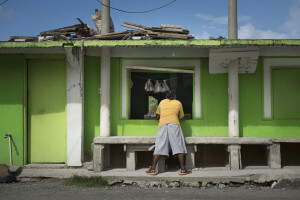 The Interior Department, which has authority over the three Micronesian nations covered by the COFA treaty, has directed financial support toward the region to help alleviate the impact of global warming, and it has held several high-level meetings, such as the one attended in March by Kiaaina, in just the past year to hear concerns and brainstorm solutions. Esther Kiaaina heads the agency that administers the COFA agreement. Climate change is one of her biggest concerns. 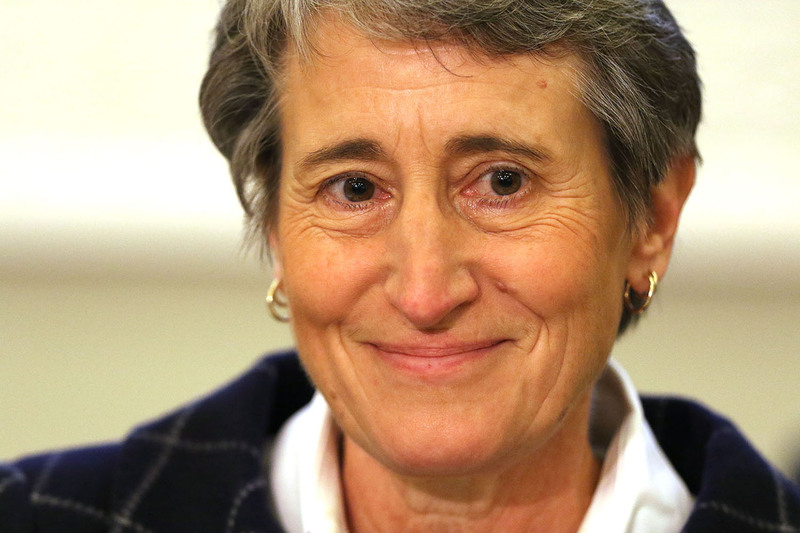 Last December, Kiaaina and her boss, Interior Secretary Sally Jewell, held a panel discussion in Washington, D.C., specifically on climate change’s effect on the COFA nations. With the top leaders of the Federated States of Micronesia, the Marshall Islands and the Republic of Palau as part of the panel, Jewell assured the audience that she understood the gravity of the situation. “You are on the front lines of coastal erosion,” Jewell said, before reiterating that climate change is not just a policy priority for her boss, President Barack Obama, but also a “moral obligation” to future generations. 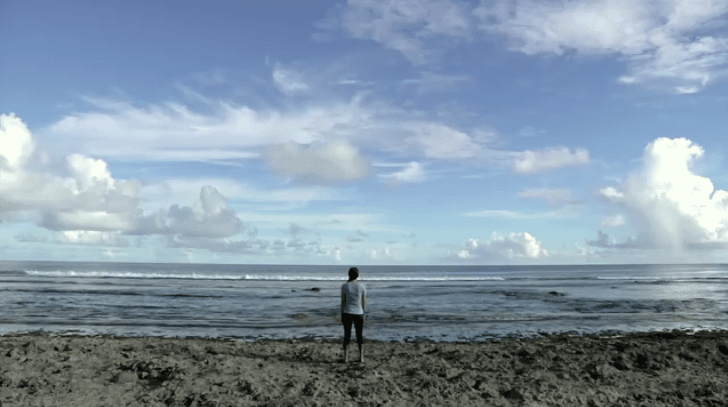 Secretary of Interior Sally Jewell recently visited Micronesia to see for herself the conditions facing islanders. Kiaaina told the gathering the government’s efforts include support for renewable energy such as wind and solar in the COFA nations and island territories, better management of land including parks and refuges, and helping to revitalize coral reefs. She pointed to community-based resource management planning in Ulithi Atoll in Yap, part of the Federated States, and four outer islands in the Marshalls, where efforts are underway. Financial assistance has come from other areas, too, including grants to “enhance the resilience” of island communities against the impact of climate change and other funding to educate islanders on climate-resilient agricultural methods. 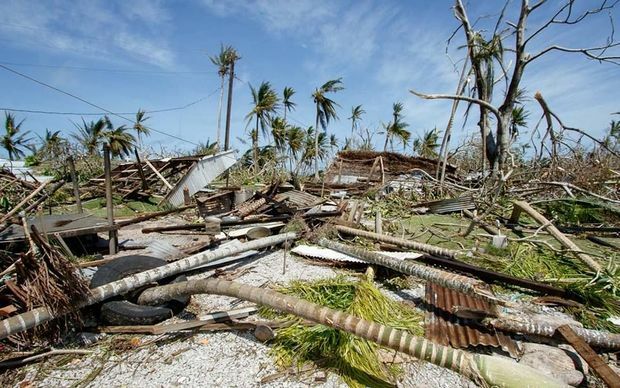 Damage caused by Typhoon Maysak in Ulithi, Yap, Federated States of Micronesia in early 2015. But critics, including the leaders of the COFA nations at the Washington panel in December, say piecemeal funding and local initiatives will have little impact on the larger crises. Paul, the Marshall Islands’ ambassador, said nations like his have been raising red flags about global warming since the 1990s to little avail. 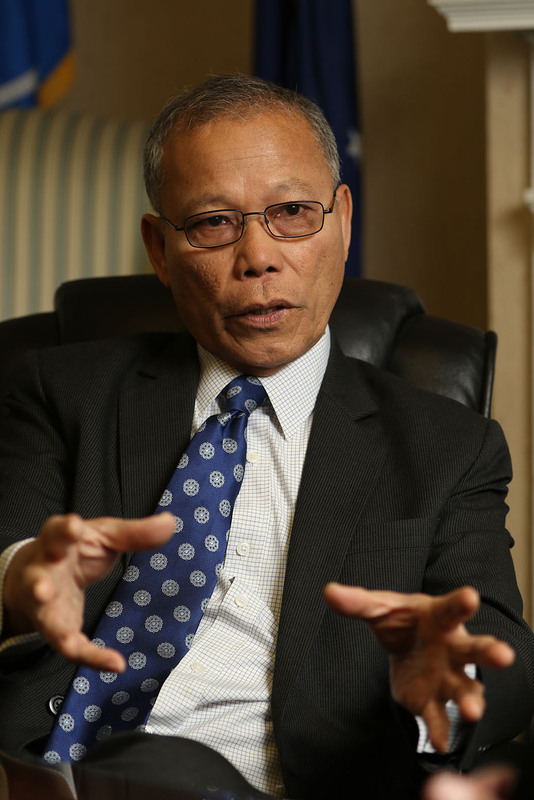 One Micronesian leader — Hersey Kyota, Palau’s ambassador to Washington — was more optimistic. 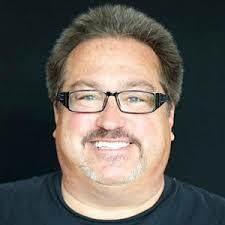 His nation is holding up better economically and isn’t seeing the exodus experienced by the Federated States and the Marshalls. Although he echoed many of the same concerns as his COFA counterparts, he also praised the Obama administration for being the first administration in his 17 years in Washington to discuss climate change regularly. The COFA nations are not waiting for the U.S. and other world powers to act. In recent years, they have taken steps to work together on climate change and to raise attention about their plight. In September 2013, leaders of 15 Pacific Island countries including the COFA nations, Australia and New Zealand, released a statement calling for “urgent action” to address climate change. The Majuro Declaration, so called because it came out of a Pacific Island Forum meeting in the capital of the Marshall Islands, states that governments in the region are committed to demonstrating leadership on the issue. The COFA nations have a relatively negligible impact on global warming, but they are setting ambitious goals in the hope that it illustrates how personal the issue is for them. The Federated States, for example, has a strategic plan to deal with the effects of climate change. Among its goals are decreasing the import and use of imported fossil fuels by 50 percent by 2020 and to have a “net gain” in both areas covered by forests and the health of coral reefs. Fishermen, like this man on Pohnpei, fear that global warming is destroying the fisheries upon which they depend. Palau’s plan calls for 20 percent of its energy to be produced by renewable sources by 2020, while the Marshalls’ plan aims for a 40 percent reduction in carbon dioxide emissions below 2009 levels by 2020. 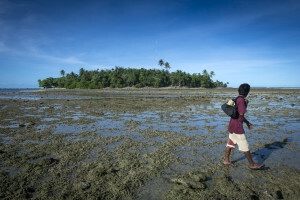 But these goals mean nothing if the rest of the world doesn’t follow, which is why the Majuro declaration, which was presented to the United Nations Secretary General in 2013, also calls on other countries to list specific pledges to reduce pollution — a kind of challenge from those most at risk. COFA nations are going beyond just their pledges, too. In September 2014, Palau President Tommy Remengesau Jr. told the United Nations General Assembly that Palau would begin formalizing a national marine sanctuary, including a prohibition on purse seine fishing in its exclusive economic zone — an area of more than 237,850 square miles. The sanctuary would allow for a “highly regulated” fishing zone over 20 percent of the EEZ to provide for only Palau’s domestic fishing needs. More recently, in April 2015, the Marshalls called for curbs on maritime carbon emissions, making the plea to the International Maritime Organization, a U.N. agency that establishes rules for international shipping. Watch VideoMarshallese poet Kathy Jetnil-Kijiner read a poem about climate change at the U.N. last year. Emissions from ships are responsible for almost 3 percent of the global total, and IMO’s research shows that shipping emissions are expected to rise between 50 percent and 250 percent by 2050 unless they are restricted. The Marshalls holds the third-largest shipping registry in the world, but that didn’t stop it from calling for reform in the industry. Carbon emissions, “including those from shipping, pose an existential threat to our people and our country,” said Tony de Brum, the nation’s foreign minister. The European Union threw its support behind the proposal from the Marshalls, but the IMO rejected the call. The rejection was led in part by Panama, which has the largest ship registry, as well as Brazil, China, India and Russia. "Each of the islands have their own different culture, different language unique in its own way." 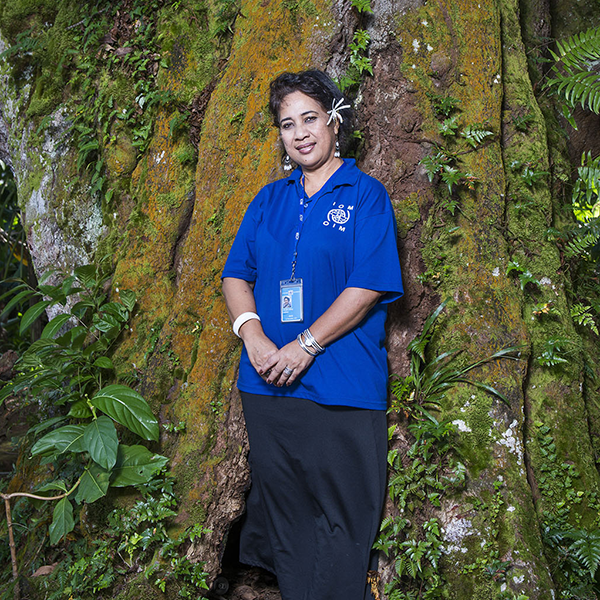 Emeliana Musrasrik is the Migrant Resource Center coordinator for Micronesia. DeBrum plans to bring up the proposal again in 2016, but until then, he is not sitting idle. 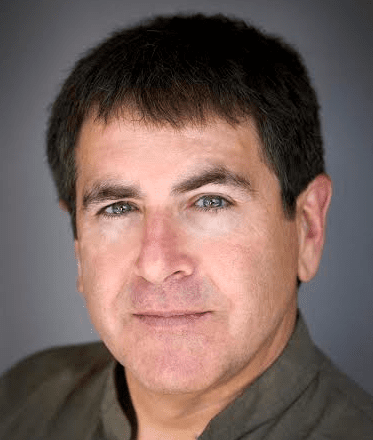 He is a frequent commentator in national and international media about the challenges his nation of islands face, and in July, he even announced a new pledge out of the Marshalls to cut its own greenhouse gas emissions by one-third within 10 years. The pledge was largely symbolic. With little industry and just over 54,000 people, the Marshalls account for “an infinitesimal percentage of the planet’s carbon pollution,” as one report explained. But de Brum said he felt he needed to make a point. Micronesia’s vulnerability to climate change has gained new relevance within the past year alone, when major storms ravaged the Federated States and the Marshalls. Typhoon Maysak, powered by 180 mile-per-hour winds, killed five people and demolished villages in Chuuk and Yap in late March. Shelters like this on Pohnpei are particularly vulnerable to destructive storms. Plywood and tin-roofed shacks are often built within a few feet of the ocean. “Ships have sunk. Homes destroyed. Breadfruits, mangoes, bananas and coconuts, our local source of food … trimmed down to just stems and branches,” a resident of the island of Weno in Chuuk said in a news report. Then, in early July, the Marshalls went under its own typhoon alert and was hit by huge waves and wind. “Newly built portions of homes collapsed, docks washed away, and high volumes of debris washed in from the storm,” a news report said. “All these years, this is the worst I’ve seen,” said longtime local fisherman Kyle Aliven. A lack of zoning enforcement means that plywood and tin roof shacks are often constructed just a few feet from the ocean. The storms, unsurprisingly, caused widespread devastation, leading many to consider migrating. Thousands of miles away, the tiny town of Milan, Minnesota — population 350 — found itself contemplating the arrival of dozens of refugees from Chuuk and other islands. More than half the town is already from Micronesia, having settled in the Scandinavian-heritage community about 15 years ago. 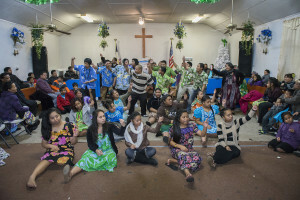 The relocation of even more Micronesian families was being encouraged. Local TV affiliate WCCO reported that families in Milan raised about $6,000 to send home to family and friends in the storm-ravaged area. 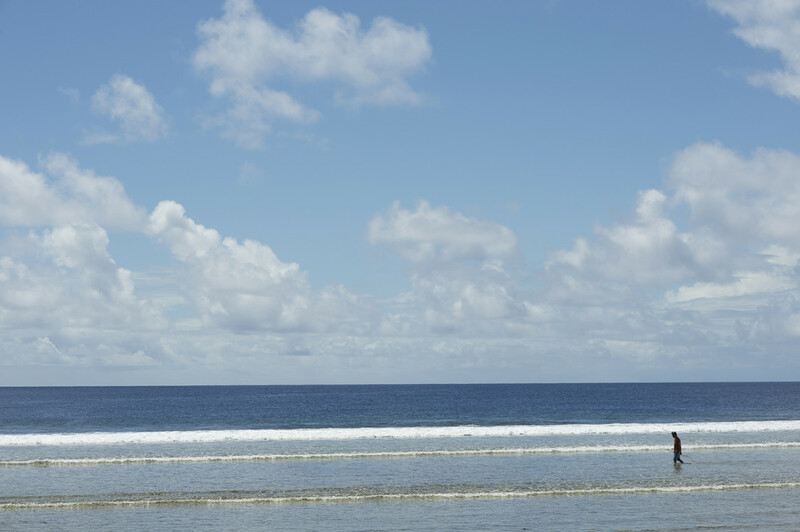 Climate change is one of the biggest threats facing Micronesia. Some officials say it will drive even more islanders to the U.S. While health, education and employment are the primary reasons COFA citizens come in large numbers to the U.S., the increasing problems associated with climate change could hasten the out-migration. The Interior Department’s Kiaaina, who now leads the agency tasked with administering federal assistance to the COFA nations, visited Guam in early June to confer with some 90 officials from the territories and the COFA nations. 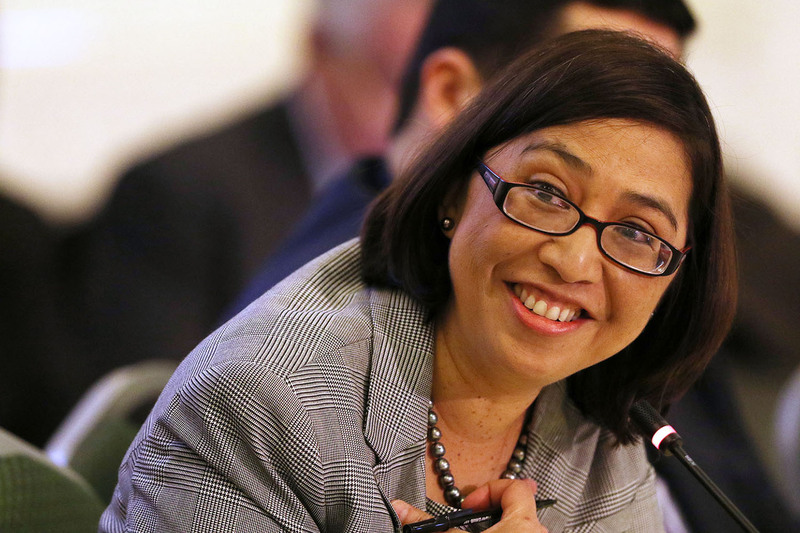 At the meeting, she acknowledged publicly that climate change could increase COFA migration. “President Obama stated that climate change is impacting national security interests, and in that vein so is Compact impact,” Kiaaina said, referring to financial assistance given to Hawaii and Guam to offset social services and other expenses associated with COFA migration. 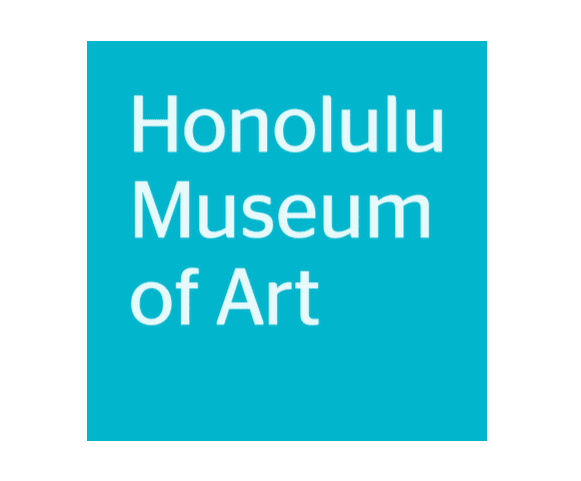 Since 2004, when Congress amended the compact and increased Compact-Impact Aid, the U.S. has provided $138 million to Hawaii and $192 million to Guam. Kiaaina, a Native Hawaiian who was born on Guam, said current levels of Compact-Impact Aid to the region are inadequate to deal with climate change, let alone pressing concerns of education and health. She says the U.S. departments of Defense, Homeland Security and Housing and Urban development need to be involved. “It has to be a collective approach by the federal government because it is a federal obligation,” she said. Meanwhile, those still holding on to their homeland are running out of options. Kelen says he understands why there has been little response to the needs of Micronesia when it comes to global warming. Kelen worries that the “big countries” may look at “small countries” like his and decide that the lives of more than 50,000 Marshallese are not worth the millions of dollars it will cost to preserve them. Mark Edward Harris is a freelance photojournalist based in Los Angeles.